We drove to Vischering Castle (official website) on the same day as Westerwinkel Castle. They are separated by ~23 kilometers, so it is a good idea to visit both. Unfortunately for us the castle is currently being renovated, so you will notice that all the windows are missing. 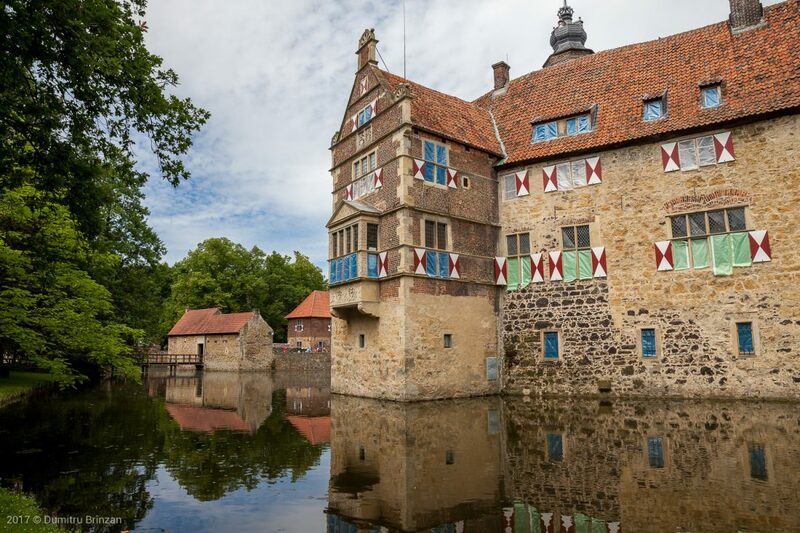 Vischering Castle (German: Burg Vischering) in Lüdinghausen, North Rhine-Westphalia is the most typical moated castle in the Münster region of Germany. 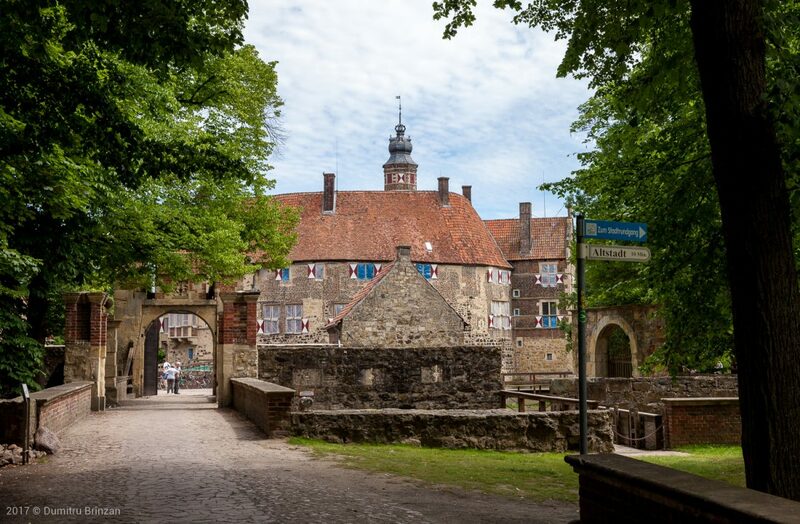 This region has one of the highest German concentrations of castles, palaces and fortifications, Lüdinghausen having three by itself. 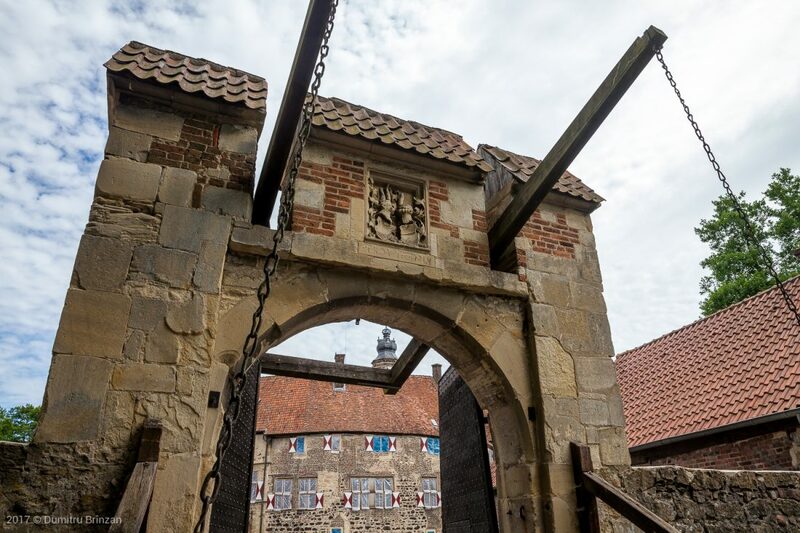 The castle consists of outer defensive courtyard, defensive gateways, moat, drawbridge, main building and chapel. 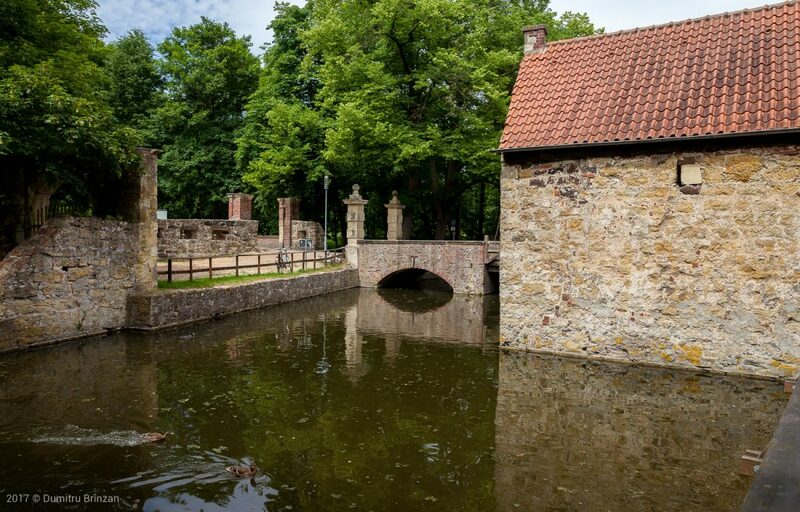 The sandstone walls, the red tile roofs as well as their reflection in the moat provide many harmonious views from the wooded surroundings. The outer defensive courtyard contains the business and farm buildings. The main building is a horseshoe-shaped three-story structure with heavy outer wall. Its inner courtyard is closed off by the chapel and a lower defense wall. A castle keep is missing, having been removed during Renaissance renovations. Fire destroyed the castle in 1521. Rebuilding took place on the existing foundation. Windows and the addition of a large bay made the castle more liveable but diminished its defensive character. The whole site however retains the character of a feudal age moated castle. Damage from air attack during World War II was minor. 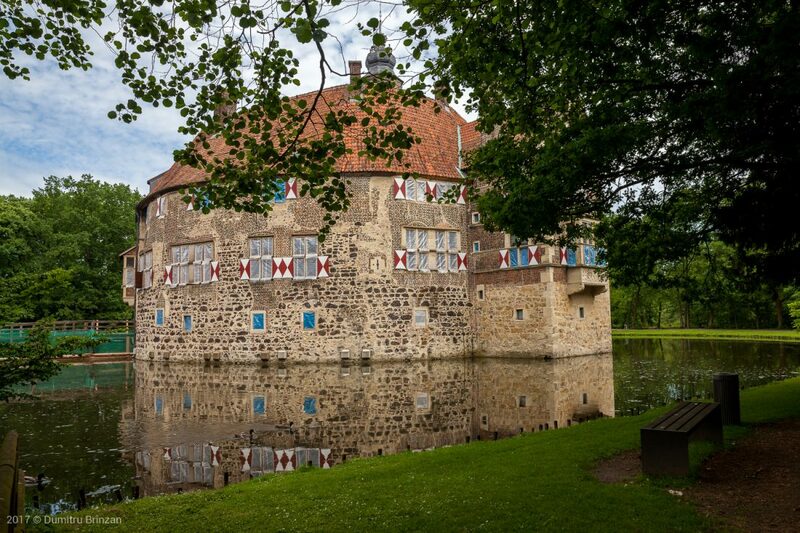 Vischering Castle houses the Münsterlandmuseum, an exhibit on knighthood for children, as well as a cafe-restaurant. It serves as a cultural center for Kreis Coesfeld. 2. I wonder how many people died under these gates. 3. Compared to other castles Vischering may look small and not too exciting. However this is a genuine, well-preserved historical structure that had a military purpose. People passionate about history and medieval times will find this museum as exciting as any other. 6. A good refuge in case of zombies. 7. Here you can buy local artisanal bread. 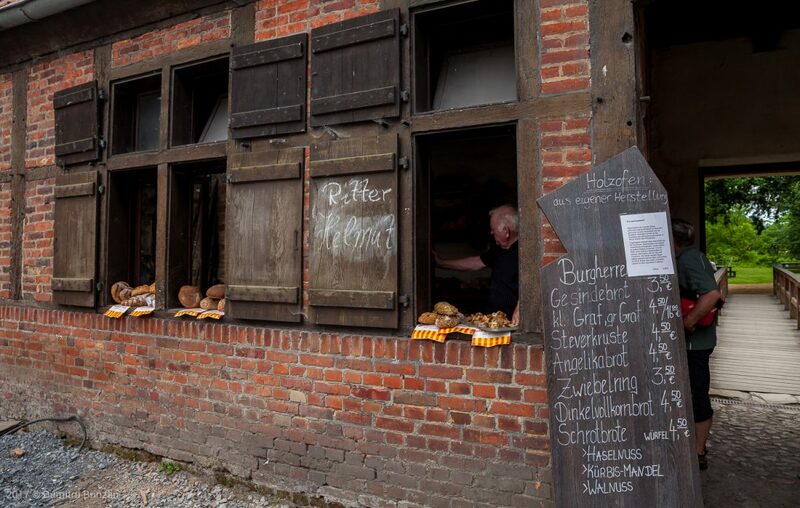 Judging by the number of people we saw with bread – it is very popular among visitors. There is a small restaurant with outdoor seating right inside the castle walls. Half a dozen picnic tables are available to the right of the castle, under the big trees. Great for a quick family brunch! 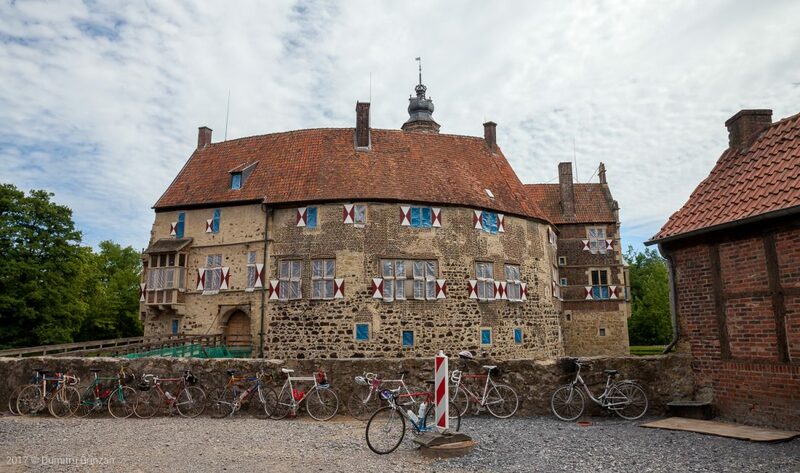 It is very easy and convenient to visit Vischering Castle. You can easily visit the other two big castles that are 10 and 20 kilometers away: Schloss Nordkirchen – Versailles of Westphalia and Westerwinkel Castle. Si noi mergem des in Munsterland. Avem o ruda apropiata in Munster, si anual ii facem o vizita. Westerwinkel e unul din castele preferate din zona. Nu le-am vazut pe toate, ca lista castelelor e luunga, lasam si pentru anul viitor.